KAMPALA, Jun 23 2012 (IPS) - As soon as Sanyu Nagia sits down outside Barbara Namirimu’s home, she asks to see her patient’s bag of medicine. It is too heavy for the ill Namirimu to carry, so her mother, Efrance Namakula, brings it out and hands it over. It is bulging; filled with anti-retrovirals that hold Namirimu’s HIV at bay, anti-tuberculosis medication to cure her of that disease, morphine to ease the pain of the skin lesions she has developed from Kaposi’s sarcoma (a cancerous tumour of the connective tissue often associated with AIDS) and dozens of other multi-coloured pills. As Nagia checks through the medication to make sure Namirimu has been taking them on schedule, her patient gives her an update. She is still feeling weak and her appetite is low. Her right eye will not fully open. But she is upbeat, smiling and telling jokes. She tells Nagia that she even had a dream about her last night. Nagia is a community health worker with Kawempe Home Care (KHC). The organisation is based in the Kampala slum of Kawempe, an area with one of the city’s highest disease burdens, and cares for nearly 1,200 HIV-positive patients in the area who are also treated for TB and cancer. The organisation’s 24 community health workers tour the neighbourhood every day, asking if people are feeling sick and encouraging them to go for HIV counselling and testing. The clinic also offers ARVs as well as other medication. They also visit patients like Namirimu, who are too weak to access treatment at their offices. Nagia has been stopping by Namirimu’s house every Tuesday since the 26-year-old registered with KHC in January. During her visits, Nagia gets updates on her patient’s health, helps out with household chores and chats. Though she suffers from TB, HIV and a range of infections that prey on her weakened immune system, Namirimu said that she knows she is improving. She credits KHC, specifically Nagia, for her improvement. KHC will be celebrating its fifth anniversary next month. In 2007 it stepped in to augment the country’s promise of universal access to HIV testing and treatment. A promise the underfunded and understaffed national health system has been unable to meet. Voluntary HIV counselling and testing is free in Ugandan health facilities, as are ARVs. But only about 20 percent of Ugandans know their HIV status, according to the country’s most recent progress report on HIV/AIDS. The study showed that 6.7 percent of adults aged between 15 and 49 were HIV-positive in this landlocked East African country. Once HIV patients are in the government system, which lacks nearly half of the needed health workers, there are gaps in counselling and treatment. Before a neighbour alerted KHC of Namirimu’s status, she had been accessing care from a government facility. The health workers there had not seen her for nearly a year and had failed to diagnose her TB co-infection. Oliver Namirimu (no relation) is the community department manager for KHC. She told IPS that the people who live in KHC’s coverage area have access to three government health facilities, including the national referral hospital. In Barbara Namirimu’s case, she never received follow ups from the government health centre and slowly deteriorated. By the time KHC found her, she was too weak to travel anywhere. Though there is no national database of community health worker programmes, groups like KHC dot the health landscape. 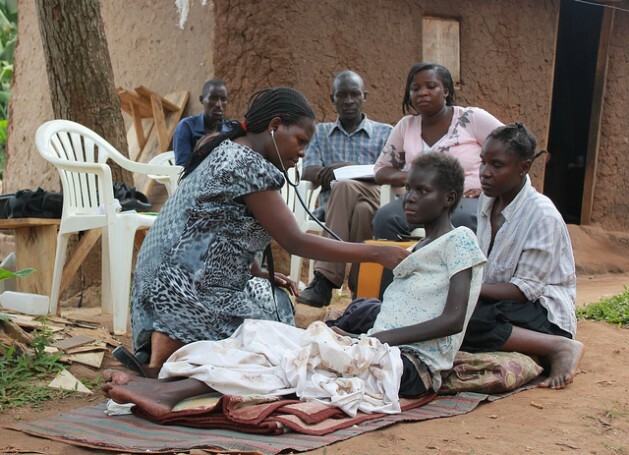 But they are still not enough to fill the gaps in Uganda’s health system. The government has trained and facilitated more than 80,000 village health team members since 2002, but they are expected to deal with a range of issues on a superficial level. KHC’s programme focuses specifically on HIV, TB and cancer, with a trained medical staff that can provide quick assistance. However, the work they are doing cannot be done cheaply, which limits the rise of similar organisations. KHC is able to operate because of donor funding and the contribution of medicines by the government. Oliver Namirimu said they are still looking for additional funding to supplement the allowances they give the community workers – about 33 dollars per month, which excludes the cost of fuel. The service they offer is critical in areas like Kawempe and other overpopulated urban settings. It can be equally important in rural areas, which have far more limited access to health facilities. Community health worker programmes have the capacity to put in the legwork required to track far-flung or transient patients. The Kawempe area, filled with cheap, temporary shacks, is an example of one of Kampala’s stopgap areas, filled with residents looking to move to more secure locations when they have money or are feeling better. During a recent trip out to the community, the shack of Nagia’s first patient for the day was boarded up and locked. The man who had lived there was HIV-positive and only partially through his treatment for a TB co-infection. Now Nagia will have to try to track him down and convince him to complete the drug course or risk developing a drug-resistant strain of the disease. The team talks to some neighbours, who are told to call them if the patient reappears. But they still have eight more patients to visit, so they do not waste too much time waiting for him to return. “He knows we will (not give up on) him,” said Aidah Nanozi, a clinician who was traveling with Nagia. It is a difficult job. The pace of the community health workers’ schedules can lead to burnout, said KHC’s Oliver Namirimu. But it does not happen often, she said. Counsellors at KHC are there to offer the community health workers support and talk about the difficulties with their jobs. Ben Kaboro told IPS that after only two weeks on the job he already understands how taxing the work can be. A former patient of KHC, he said a combination of HIV and TB had left him “bedridden” and “disturbed me so much.” His experience with a KHC volunteer, who nursed him through his recovery, made him want to help others in the same way. He is shadowing Nagia before he begins working on his own. “I didn’t want to see others going through what I have been through,” he said.